Amhra House is a development of apartments which are located in the heart of galway city centre, located beside corrib shopping centre for maximum convenience. Amhra House was purpose built for students attending university in NUI, Galway. The apartments have been designed to maximise student life with just 3 students sharing an apartment. The apartments are built around a large courtyard enclosed by the building. The management of Amhra House are there to ensure a safe and comfortable environment is provided for students to ensure a student can maximise their academic and social lives while studying in the Galway University. Amhra House was designed and built for NUI Galway students. All students have there own dedicated study area and desk. The apartments are all filled with NUI Galway students which is great for meeting other NUI Galway students. City centre location. 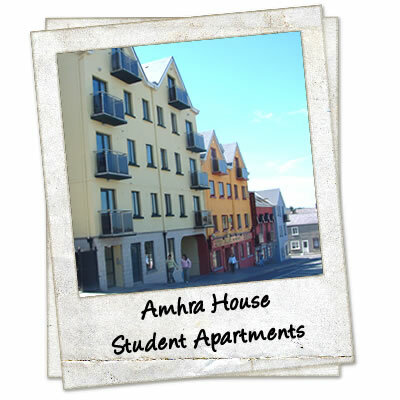 Amhra House student accommodation is located beside corrib shopping centre in the heart of galway city. Only 10 minutes walk to the university makes amhra house one of the closest you will find. Free internet access. Amhra House has a high speed dedicated internet connection with connection points in each apartment at each students study desk. The network is safe and secure and is designed to ensure each student gets a high speed connection. Washer Dryer in each apartment. In Amhra House each student apartment has a washer dryer machine which ensures you dont have to pay extra for tokens for central laundry facilities. Multi Channel TV. The latest programes are always available with multi channel tv service to each apartment.